2013-05-07 Visit a Jewish preschool or kindergarten at any time of year, and ask a young child what the next holiday is. The answer will always be the same . . . Hanukkah!! We are happy to report that today, that answer is nachon me-od. What’s the next holiday?? Hanukkah! Can’t you just see the candles burning brightly in the menorah? Hear the music of Maoz Tzur? Smell the latkes frying in all that oil? Well, here at Learn Hebrew Pod, we actually can! Jonathan is singing and playing Hanukkah music at the piano. 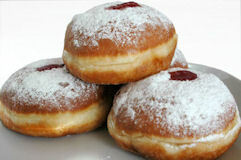 And Eran and Liat are busy in the kitchen cooking up some levivot and sufganyot. So we’ll have the perfect chance to learn lots of Hebrew words related to cooking, recipes, and groceries. We’ll learn a little bit about the rich traditions of Hanukkah. And . . . how could we have a party without inviting our friends, the pa-al verbs? It just wouldn’t be right . 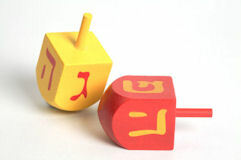 . . especially since the word Hannukah itself comes from a verb in the pa-al building block! So gather your friends and family, light the candles, put some levivot on to fry, and join us for Learn Hebrew Pod’s special celebration!